It's been a very long time since we've seen anything TRULY new from the big "W". The MX5 was the last 'new' machine but was based on MXT technology. While it did pretty well, it never really seemed to find it's market. It's priced up there with the AT Pros but never garnered the respect the AT Pro gets. Enter the Treasuremaster. I've been detecting 30 years, and I've used 'em all. This little machine has more 'pro' features than any other machine out there in it's price range. It's sensitive, deep, easy to use, lightweight and should give that little banana colored beeper some serious competition as the Treasuremaster isn't even in the same class as the Garrett Ace, but it's priced where the Ace is. 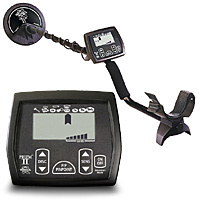 Real automatic ground balance, VCO pinpointing, adjustable target volume, 4 tone ID, 8 segment disc, threshold hunt (a sensitivity feature that no other detector has under $300), runs on 2 AA batteries for 20 hours and it's weatherproof. (Let's call it rainproof). It's weighs in at about 3 lbs. A little extra 'beef' than the featherlight detectors like the Tek Delta 4000 but the extra heft makes it feel like a better built detector. I've had it out about 5 times now and have re-hunted some sites that I've been over. Finding a lot of clad. I'm not finding much in the way of serious keepers, but that's the fault of my location and not the detector. The detector hits coins very solidly and will lock on a target. Target ID is pretty much the same as other White's machines. 70's-80's are dimes/pennies/quarters, nickels ring up at a consistent 20-24, zincs read 59-61. I hunt in Georgia red clay and it seems to handle the hot soil well. You can hear the detector update the ground balance if you lift the coil about waist high and walk with it in the air. You'll hear a deep beep every few seconds. Using it is as easy as turning it on, use the UP/DOWN arrow by the Options button to set a slight threshold and start swinging. If the detector falses, simply turn the sensitivity down using the +/- buttons. The various settings are selected by pressing the Option button and cycling thru the various tweakable settings. The display numbers are large and easy to read. Not as big as the Fisher F series, but much easier to read than even my expensive MXT. I found the 4 tone ID a little annoying especially in hotter ground and it can false and cause some random low tones. Setting the tone ID to 2 tones solved that. 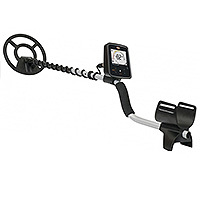 Overall, the Treasuremaster is MUCH more machine than the Coinmaster/Pro series it replaces and MUCH more machine than it's target competition the Garrett Ace series. I think given some time, the Treasuremaster should become a popular choice in the vast array of detectors out there.